Another month gone and you haven’t seen what the clever Apatcheez have been up to for a while now. So here’s what they’ve been doing…. Faith finished this wonderful quilt – the flowers are entirely made from the fabric she won in the Apatchy Christmas lucky door prize – thanks XLN Fabrics! And thanks Faith for a wonderful job. Another surprise was Julia’s bespoke ‘beaded’ necklace – what a wonderful gift! Sharyn spends her free time creating these little beauties – we especially like the fancy-pants signature. While we’re on the subject of gifts – I think Faith’s latest creation might be headed for someone else too – sorry about the deck lighting in this shot – not the best background. Angie finished her bag from our class a couple of weeks ago and she look very pleased with it – as she should! And Elaine finished her version – with her fancy embroidered bee! Jan was busy with the Tilda block of the month but still managed to finish this pretty Tilda Club stitched bag. Oh and while she was at it also finished this bag – made from hexies sewn from her leftover Fiesta project – see what you can do with scraps. Joan was the first to complete the project-of-the-month with this bright mesh bag made with Kaffe Fassett Collective fabric – way to go Joan! The youngest Apatchee, Baileigh finished this lunch bag for a school project – well done Baileigh! 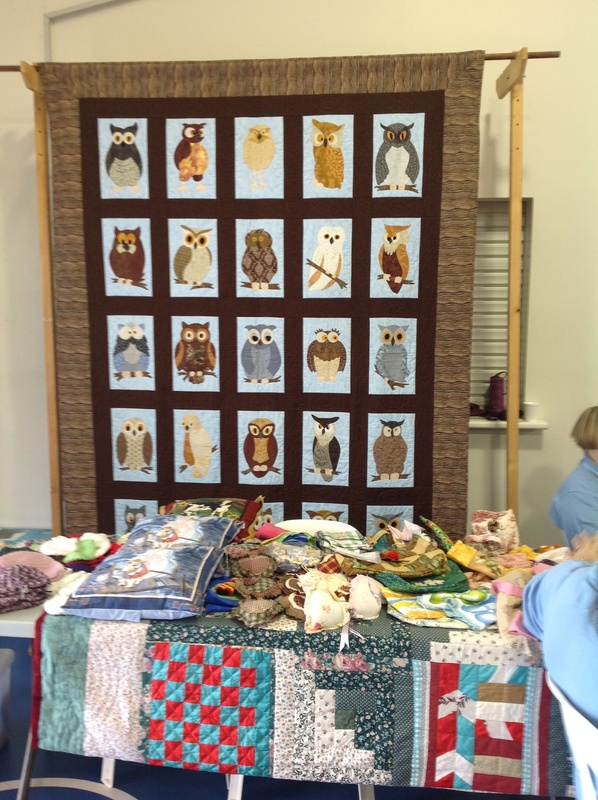 And finally, Joananne sent me a photo of another finished project – a very clever way of using bunting and soft toy fabric to make a child’s quilt – and the back of the quilt has the back of the owl – very clever too. There’s lots more of course as well as AQC but that’s for another day. On the road this weekend at the Esk Quilt Show. Last night we dined at the Club Hotel and not only did we have a very enjoyable meal up also we took out two prizes in the chook raffle – Jan’s going home with a chicken platter and I won the barbecue tray so guess what we’re having for dinner on Sunday night? 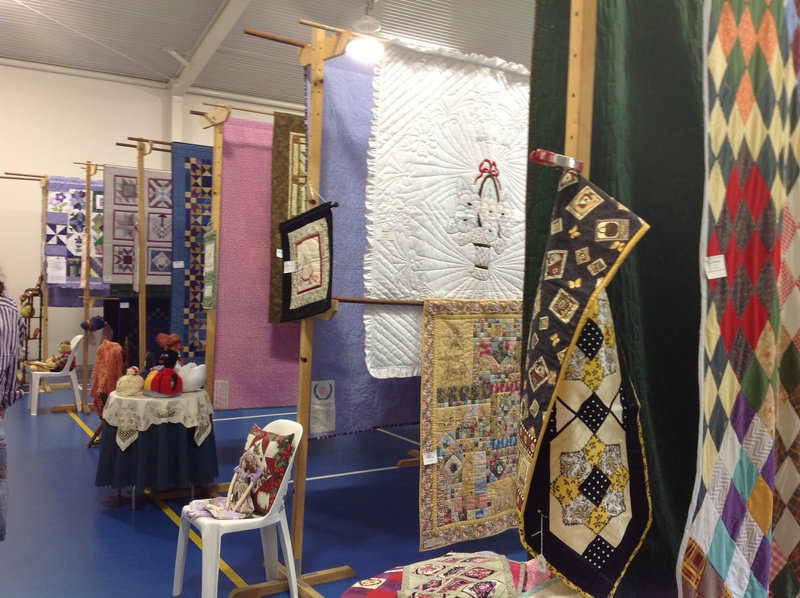 There are a wide variety of quilts here at the show including some made especially for International Women’s Day – all green, purple and white. The textile artist Hetty van Boven just opened the show and talked about why she enjoys quilting. She said that you can start from the beginning and make something beautiful (which is certainly true just look at the sampler quilts in the gallery that our new students have made). 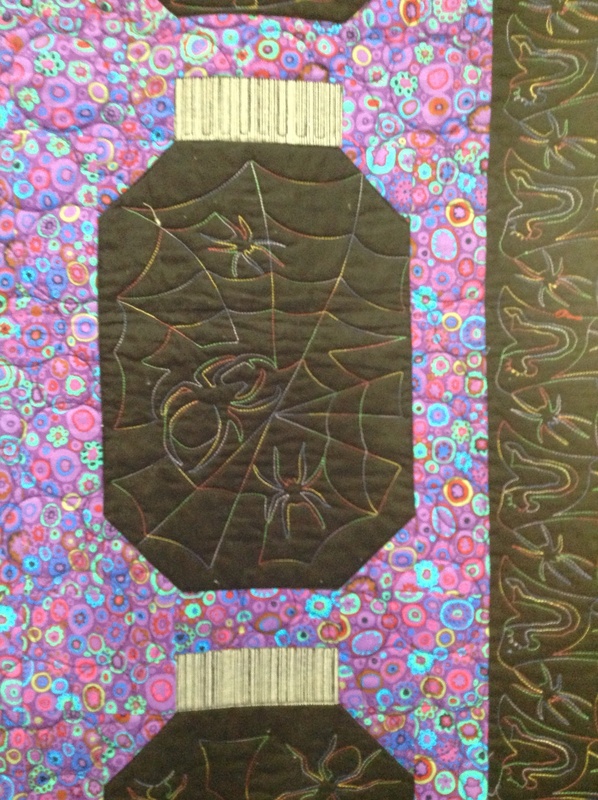 She said that patchwork and quilting inspires you to create your own pieces so even if you follow a pattern the end result is still individual (again just look at the gallery for proof of this). Finally she said that enjoys the camaraderie of the quilting group and how we can share our lives and “share our wisdom”. What a lovely expression. And here’s the wonderful raffle quilt – hoo wouldn’t want to win this?